Utrecht is a city Bath can learn so much from. People were drinking champagne on the street and enjoying beautiful singing; not something you see every day. They were celebrating the opening of yet another reconstructed street in Utrecht; their street, with their homes on it. 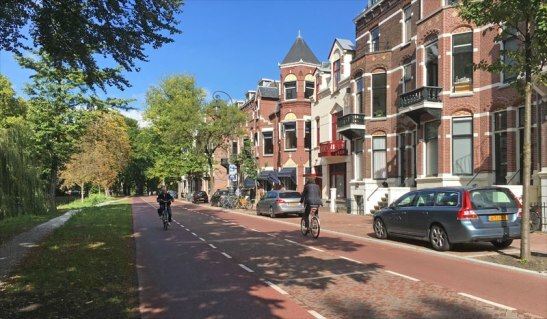 Again, the city of Utrecht has reclaimed a lot of space from motor traffic, to become living space for people. The new Maliesingel has become a very pleasant residential street alongside the old Utrecht city moat. The walking path on the left hand side could only be rebuilt because the roadway is so much narrower now.